Only one day after the 1968 assassination of Martin Luther King Jr., singer James Brown, seen here in 1973, performed in Boston, Massachusetts. That same night, violent protests broke out in many U.S. cities. However, Brown’s concert, which was broadcast on local television, helped ensure a peaceful night in the northeastern U.S. city. After King’s death, many now questioned whether nonviolence was more effective than violence in the civil rights struggle. When the news reached people’s ears, angry protests broke out in many American cities. The next day, April 5, U.S. city governments prepared for what they expected could be a second night of violent unrest. In Boston, Massachusetts, mayor Kevin White was one of many U.S. mayors concerned about ensuring his city’s safety. Just four months after being elected mayor, White had a real crisis on his hands. The night before, rioters had set fires in Boston’s Roxbury neighborhood. To make matters worse, the popular African American singer James Brown had been scheduled for months to give a concert on April 5 in Boston Garden. 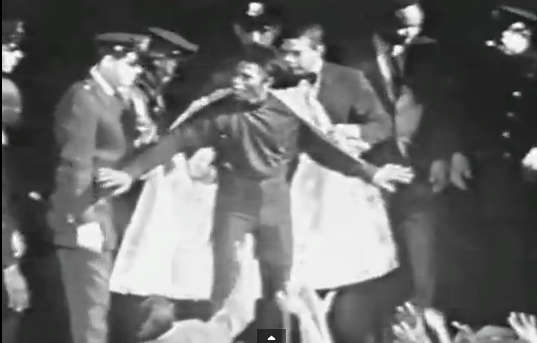 Many Bostonians feared that a concert by the African American singer would attract a violent and angry crowd. However, White worried that by cancelling the concert, he would anger Boston’s African American community. A solution came from Tom Atkins. Atkins was a young, African American Boston city councilman. Atkins recalled in 2008 that mayor White had reasoned that Brown’s concert “could bring as many as 20,000 black people, young people, into the city. It just had too much emotion in it. That would be a problem.” Atkins disagreed. “I said, ‘Kevin, you are doing exactly the wrong thing,'” Atkins remembers. “‘If the black community hears that the city stopped James Brown from performing, all hell will break loose. '” Atkins thought that James Brown’s presence in Boston might actually prevent more violence. He advised the mayor to allow Brown’s concert to proceed as scheduled. However, he suggested that the city also find a way to broadcast the concert for free on live television. A televised concert, Atkins thought, might keep Bostonians at home instead of in the streets. Mayor White agreed. White and Atkins convinced Boston public television station WGBH to air that evening’s concert. However, there was another problem. James Brown was already under contract to perform another televised concert at a later date. If the Boston concert was televised, Brown stood to lose $60,000 by breaking his agreement with the other station. Brown let mayor White know about the money he stood to lose, and White agreed that Boston would cover this amount. Mayor White held a press conference later that day. He encouraged Boston residents to stay home and watch the concert on television. Vickers and thousands of other fans cashed in their tickets at the Boston Garden box office. The concert proceeded peacefully. However, near the end of the show, there was a problem. Some of Brown’s fans, both black and white, had become so excited by the music that they began to climb onstage and swarm the singer. Brown sensed that this incident could quickly turn violent. He knew that the police stationed in Boston Garden that night were expecting—and were more than ready—to head off anything that they perceived as violent behavior. The police started to push back the concert goers. After a pause, Brown asked, “Now are we together or ain’t we?” The crowd cheered in response. The concert continued peacefully. Martin Luther King Jr’s assassination in April 1968 caused anger, frustration, and grief among King’s supporters. In some cases, those feelings led to acts of violence and destruction. Pictured, a solider stands guard in Washington, D.C., in front of buildings destroyed during the rioting. More importantly, Brown’s presence helped maintain peace in Boston that evening. That same night, there were riots in over 100 U.S. cities. Many buildings in Detroit, Michigan; Newark, New Jersey; and Washington, D.C., went up in flames. Dozens of people throughout the U.S. were killed, with many more injured. Through the power of his music, Brown helped keep Boston quiet during that charged evening. In the following weeks, the singer received offers to perform in other U.S. cities. He was even invited to Washington, D.C., simply to speak to rioters and not to perform. In May 1968, President Lyndon Johnson invited James Brown to the White House. The following month, the government sponsored Brown to perform for U.S. troops in Vietnam. Read more about James Brown’s Boston Garden performance at the Boston Globe and American Public Media. Learn more about the life and music of James Brown at Britannica and the Rock and Roll Hall of Fame. Watch excerpts from James Brown’s historic Boston concert at WGBH.